Located 28 miles north of Austin, the Sheraton Georgetown Texas Hotel & Conference Center anchors the upscale 32-acre Summit at Rivery Park, which overlooks the San Gabriel River. Hiking and biking trails are easily accessible, as is the scenic Blue Hole. Enjoy our proximity to Georgetowns beautiful town square and Southwestern University, plus the great shopping at Wolf Ranch Town Center and Round Rock Premium Outlets.Each of our 222 modern guest rooms is a welcoming haven with a warm color palette. Modern touches include a flat screen TV, High Speed Internet Access, and convenient electrical outlets. 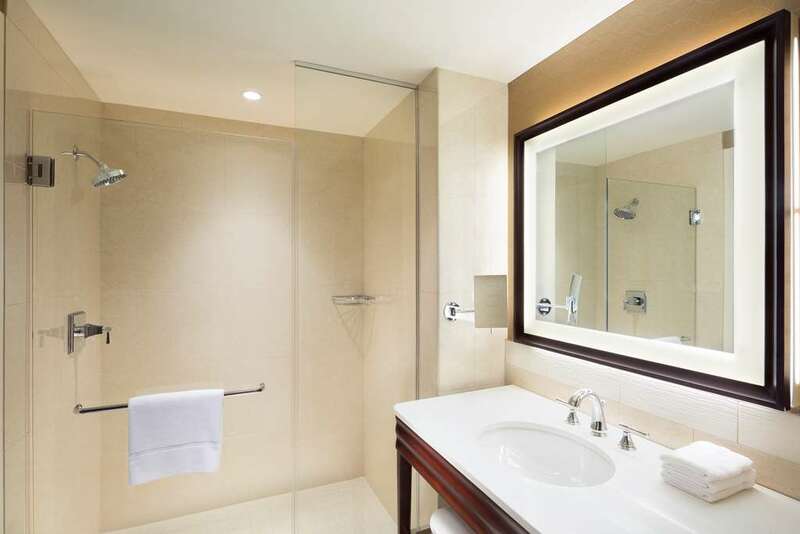 The Sheraton Signature Sleep Experience ensures a great nights sleep, and refresh in the bathroom that contains a glass-enclosed shower or a bathtub.The hotels stylish atmosphere features all the signature amenities and services you expect. Go for a swim or simply lounge at our oasis-like pool. Gather with colleagues, friends, or family over delicious meals at our restaurant and refreshing drinks in the modern lobby bar.With 30,000 square feet of function space, the Sheraton Georgetown Texas Hotel & Conference Center is an ideal setting for meetings and events of all sizes. Choose a venue that suits your needs from 14 meeting rooms including a stunning 16,000-square-foot ballroom as well as 7,000 square feet of outdoor space. Located 28 miles north of Austin, the Sheraton Georgetown Texas Hotel & Conference Center anchors the upscale 32-acre Summit at Rivery Park, which overlooks the San Gabriel River. Hiking and biking trails are easily accessible, as is the scenic Blue Hole. Enjoy our proximity to Georgetowns beautiful town square and Southwestern University, plus the great shopping at Wolf Ranch Town Center and Round Rock Premium Outlets. Unwind at our rustic-chic Jack s Lounge on the lobby level. Connect with friends over craft cocktails at the large reclaimed-wood communal table, or lounge in intimate seating arrangements with a glass from our wine-distribution system. Part wine bar, part local pub Brix and Ale serves classic comfort cuisine complemented by a boutique wine, beer, and cocktail program. Settle in for a warm, welcoming experience with family or friends over delicious food and drinks. - Sports Clips International, Inc.